Wapung Pamra PHC of Khliehriat block in East Jaintia Hills of Meghalaya is one of the biggest PHCs in Meghalaya covering a population of 30,770. However, it was not been able to function as a 24×7 PHC due to non-availability of potable water. The available water in the PHC premises was not fit for consumption as the pH was 4.2 resulting in the area is surrounded by coal mines. The Medical Officer in the PHC tried his level best to solve this water problem as the people who could not access In-patient Department services in the PHC. He discovered a water source in a hilly terrain with the help of the local people, which was not contaminated by coal mines. But, it was 2 kms away from the PHC. In February 2016, the PHC staff along with the people from the Wapung Shnong village tried to bring this water to the PHC through plastic pipes purchased from RKS and Megha Health Insurance Scheme (MHIS) funds. 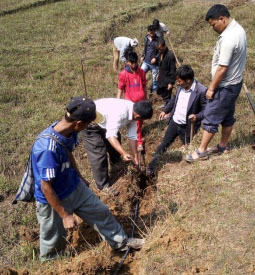 Subsequently, the VHSNC members under the community action for health, decided to help the PHC staff to underground the pipelines in order to avoid the frequent damages. In March 2016, the members from the VHSNCs of Tuber, Mukhaialong, Wapungskur, Pamrapaithlu, Iongkaluh came together and made the pipelines underground. The district NGO, Mih-Myntdu Socio Cultural Welfare Association (MSCWA), which is mentoring the VHSNCs also joined hands in this noble venture. With the joint efforts of all, safe drinking water is available now in the PHC and it is ready to start 24×7 services as soon as they receive necessary equipment for the labour room and the general wards.